Takes a direct line left of Get a Grip on Yourself. Start below a scruffy crack, make a few moves up this before swinging out left onto the wall (BR), good holds enable you to clip (BR), devious but direct moves allow you to stand on the good move up awkwardly to good holds just above 3rd BR. Continue more easily up the wall past the new replacement (BR) on Get a Grip on Yourself. Step left at the top to a new double bolt belay. 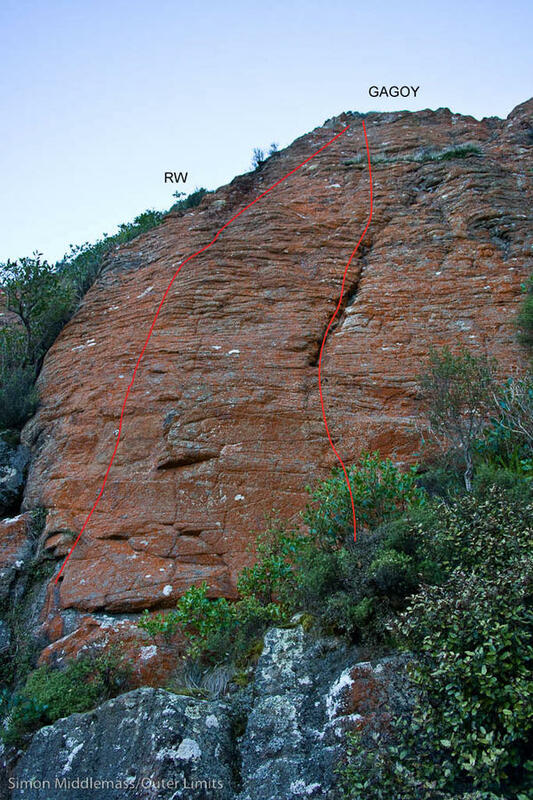 The crack on the Red Wall, 6m left of W. Climb the crack until it runs out, move left to a bolt which protects the scramble to the top.